In the water world, which was two worlds before ours, there were two snakes. They were exactly alike, and they were always together. They were always coiling around each other and you couldn't tell whether it was one snake or two. Sometimes, one would swallow the other, and then it would shed its skin, and the skin would turn into the other snake and they would go back to their play. It was their way of making love. They gave birth to the spirits of all the animals and plants, but there was no place for them; they just had to swim around in the water that was everywhere. 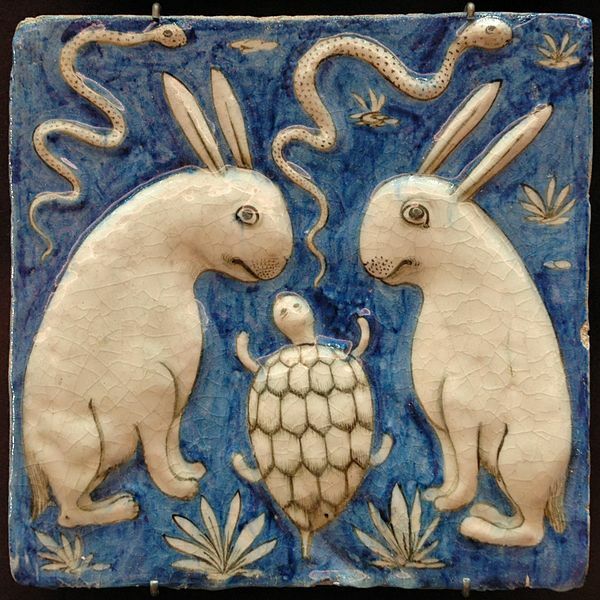 Then Rabbit got jealous of the way the snakes always had so much pleasure just by touching each other. He went and asked them, "can you teach me how to do that?" But they didn't pay any attention, they were enjoying themselves so much. So Rabbit got mad and bit one of the snakes and killed it. The dead body of that snake became land, and all the animals and plants had a place to live. It was now the land world, the last world before ours. Rabbit found another rabbit and did what he had seen the snakes doing. He wasn't as good at it as the snakes had been, but soon there were lots of rabbits. He taught all the other animals to do the same thing, but they didn't learn it as well as Rabbit, and there were never as many of any kind of animals as there are rabbits. After a while the other snake got lonely. He had the power to change death to life. So he bit the body of second snake, and it woke up. He was mad at Rabbit and hunted him down and bit him to death. That was how Death came into the world. But the second snake was now different from the first: since he had used his bite for death, he could no longer use it to give life. The two snakes talked about it and decided they couldn't play together like before. The first snake said "I'll go above and be the Sun; you go below and be the Darkness." All the animals decided which ones would be awake in the day and which in the night. Then the second snake asked "How will we be able to talk to each other and decide when to send life and when to send death into the world?" The first snake thought about it, then he bit the dead body of Rabbit and it woke up. Snake said to him, "You are the cause of all the trouble. You are responsible for bringing both death and life into the world. You will now have to be awake both day and night, and take messages back and forth. You will be called Man." The snakes taught Man how to make fire, so he could see at night, and how to make weapons and tools and clothes, and how to make dances and songs to carry messages back and forth between the Sun and the Darkness. The two snakes went to their places, and Man did what he had to do. That was the beginning of the Sun world, the one we live in.